Slayers has had some ups and downs as a franchise. Due to its unique mix of comedy and action in the main shows, it can be hit or miss. The shows are able to utilize this quite well and the movies have had success as well. For some reason, the OVAs are the ones that have a lot of problems. Just like the first OVA, this one was not very good. It focused way too much on the fanservice and comedy angle while neglecting the action that brought this series a lot of fame and fortune. There are three episodes in this OVA. The first one involves the initial encounter between Naga and Lina, which is how their adventures ultimately began. Naga will stop at nothing to defeat Lina, which proves to be a thorn in the side of the main character. Naga may be decently powerful, but she’s also reckless and leaves a lot of damage and devastation in her wake. She claims to be Lina’s rival, but she’s really more of a tag along at this point. It’s intriguing to see how these two met, but I can’t say that a whole lot came out of it. After the first few minutes, we are essentially back to the status quo except for the fact that Naga is trying really hard to surpass Lina when in the current days, she is already accepted as a rival. The episode had potential, but then the OVA decided to play up the fanservice angle. I’ll mostly talk about that towards the end of the review. Needless to say, of the three episodes, this was likely fell in the middle. I’m glad that Lina essentially proved that these two fighters aren’t even close, but more of a serious fight would have been nice. The second episode involves a rich girl who has hired Lina to be her bodyguard. Lina accepts because of the huge sum of money that will be given to her as a reward, but this appears to be a rather large error in judgment. Lina has to pay for travel expenses and for the food so she quickly spends her reward. To teach the rich person a lesson, Lina arranges for some bandits to kidnap her, but this may backfire when real ones show up to take her! The rich person seemed to be par for the course as far as these individuals tend to be in anime. Her laugh was very similar to Naga’s, which was eerie for Lina the whole time. Still, it wasn’t a bad segment at first, but the ending quickly drove it down to last place from the 3 episodes. It was simply terrible and an example of why mixing comedy with action is rarely done. Typically, the result is that both areas will fail and that’s what happens here. It’s one of those stories that was simply better off not happening. Finally, we go to a village where two fashion designers argue about whether clothing should be classic or modern and risky. Lina and Naga naturally choose two different sides so then they argue about which one is better as they burn down each other’s bases. By the end, they start to learn the values of friendship, but I can’t say that it was a very entertaining episode. It’s actually tough to decide if this one actually beats the first episode or not, but I believe that I gave it a slight lead. At least Lina hesitates a little when asked to blow up the opponent’s base. Something that Naga certainly didn’t do! All right, let’s look at the main reason why Slayers Excellent was doomed from the start. It all goes back to the fanservice angle. There isn’t a ton of it visually, but when you consider the chest insults directed at Lina, it gets to be a bit much. There was also a random hot springs scene thrown around and a lot of attention is given to Naga’s outfit. It’s seriously sad and I haven’t seen this much fanservice associated with Slayers since the first outfit. There’s nothing over the top, but it still happens enough to make me give it a thumbs down right away. This really just exposes the fact that the writers were not confident with their story so they felt like they had to add something to throw the viewers in at the expense of a few stars. A good Slayers story should always be a 7-8, but this one was not good. At least the animation is decently good as can be expected. It’s rather old so J.C. Staff doesn’t look quite as good as they do nowadays. Right now, they are one of the best animation companies of all time. I would need to compare Slayers to other shows of this era to properly rank it, but it looks good enough. There aren’t many energy blasts after all so it’s a little harder to gauge. It has that 90’s feel, which is always a good nostalgia boost to any series. I consider DBZ to look great even though I have seen many say that it wasn’t very good even for its time. Excellent’s soundtrack is decent although very generic at this point. The series needs to try and add in some new tunes at this point. Relying on the same classics is all well and good, but more variety is always a good thing. The new tunes may not be instant classics, but you’ll never know how good they can be if you didn’t give them a chance. These tunes are decent, but they certainly aren’t very thrilling or memorable at this point. Lina is a good character as always. She may not be a hero, but you can still root for her as she typically only beats up opponents who get in her way. Getting rich is a noble goal and she typically doesn’t take any short cuts. Unfortunate things just tend to happen to her so that she never ends up with any money in the long run. She seriously has no luck when it comes to anything financial so it is a good thing that Lina is one of the strongest sorceresses on the planet. Naga is really the only other recurring character and she still isn’t a good supporting character. She has some good traits like being overconfident and constantly trying to one up Lina, but that’s just not good enough to overshadow her negative qualities like the fanservice and chest comments. She also gets the duo into a lot of trouble by not thinking things through and just being very reckless. I like when characters are reckless, but when it is intentional, not accidental. Overall, Slayers Excellent is a trilogy that you should just skip. It doesn’t add anything worthwhile to the Slayers mythos and you can essentially say that it is just poorly written filler. The actual filler in the series is better than these episodes, which really says something. The animation and soundtrack are decent, but that’s not enough to save this one. I’d advise you to skip this and just watch Slayers Next if you’re looking for a nice fantasy adventure. Slayers has a lot of different shows and movies so you just want to memorize the full titles. Next>>Try>>Gorgeous>>Whatever else the others were>>>Excellent. I do like the fact that all of the movie/OVA titles are basically synonyms. It’s a fun trend, even if the OVAs can’t live up to their titles. 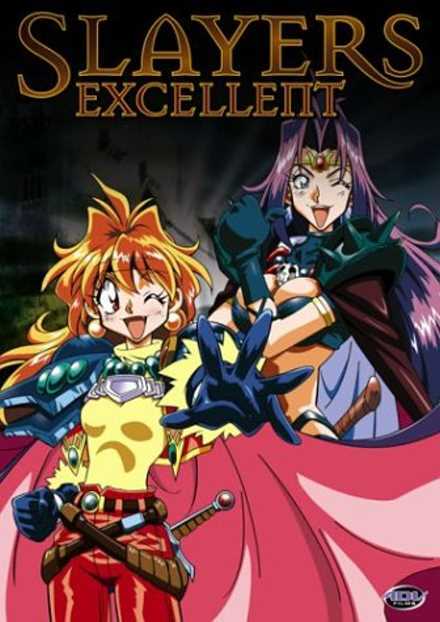 This entry was posted in 4 Star TV Shows, Reviews, TV Show Reviews, TV Shows and tagged Action, Anime, Anime Review, Comedy, Fantasy, Lina Inverse, Naga, OVA, OVA Review, Review, Slayers, Slayers Excellent by dreager1. Bookmark the permalink.